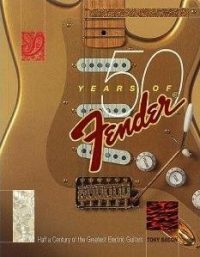 This was our complete reworking in 2007 of The Fender Book. We made it in the new format for our Profiles series of guitar-history books, which we’d begun with 50 Years Of The Gibson Les Paul in 2002. It meant a bigger page size and an elegant softback jacket with flaps (for a rare view of the jacket, click here). That in turn meant that we redesigned the picture pages from scratch, and I took the opportunity to rewrite and update quite a bit of the general text as well as to update the reference section. The Fender Book, the book on which this was based, was the very first thing that I published with Nigel Osborne for our new firm, Balafon. We set up Balafon in 1992, in the wake of producing The Ultimate Guitar Book for Dorling Kindersley. (As big fans of abbrev, we always call that book UGB, and its publisher we always called DK, among other things. More on the UGB here.) Balafon later morphed into Backbeat. Nigel and I always thought of the move to do our own stuff as something like a band making an album for a major label, soon becoming dissatisfied, and then thinking, hmm, why don’t we do this ourselves? And then setting up an indie. Sort of mad and sort of brave. Balafon was our own indie books label (“imprint” in publishing jargon), and it was the start of what turned into Backbeat. We knew from the success of UGB that people really liked our idea of guitar books with quality writing and quality pictures. Now, don’t get me wrong: that dissatisfaction I mentioned wasn’t with the UGB itself. On the contrary: we were proud of it. It was DK we weren’t so happy with: they didn’t think like we did. We had something else in mind, but retaining all the quality we’d put into the UGB. The result was TFB. 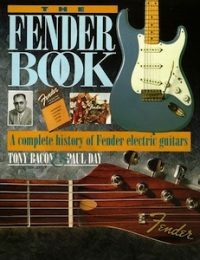 The Fender Book set the template for what we’ve come to call our Profiles series of books – effectively all our illustrated guitar-history books – which as you’ll see from the Books page here is now pretty long and impressive. Back then, however, we were finding our way. Anyway, I wrote the main story, based on lots of research and the many interviews I did with Fender people old and new. You can read an extract from my interview with Fender boss Don Randall by clicking here. In 2000, we made a sort of side order, 50 Years Of Fender (jacket below left), that ran alongside The Fender Book. For this, Nigel and Sally came up with a completely different look: a double-page spread for each year, starting in 1950, with a featured instrument and catalogues, pictures, and other illustrations on the right, and a story on the left. 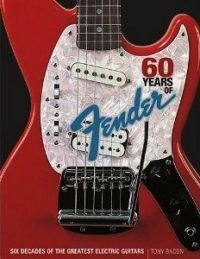 Rather nice, actually, and this book also added in Fender acoustics, basses, amps, and the rest. In fact, we liked the idea so much, we updated it in 2010 to produce (can you guess the title?) 60 Years Of Fender. Anyway, back to the timeline for The Fender Book. 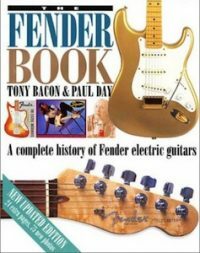 For the next big update, in 2007, we retitled it as The Fender Electric Guitar Book – and that takes us neatly back to the subject of this entry here, with the jacket pictured up on the left. 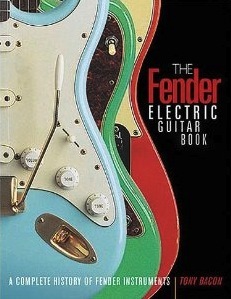 The Fender Electric Guitar Book remains my current general history of Fender.